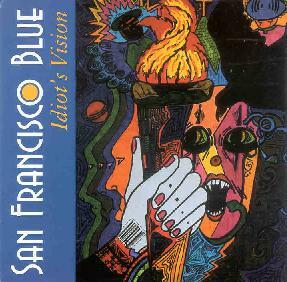 San Francisco Blue - "Idiot's Vision"
San Francisco Blue is a duo project of original Jefferson Airplane bassist Bob Harvey and Brian Fowler of Jones Ave and Superczar, plus numerous guests. The band is called San Francisco Blue to reflect Harvey's roots in both San Francisco and Bluegrass music, which he played both before and after his time with Jefferson Airplane. The music on Idiot's Vision is intended to be based in bluegrass music and strongly influenced by both folk-rock and psychedelic music. The music does indeed include healthy doses of song oriented Blues rock, Bluegrass and Folk with some psychedelic influences cropping up from time to time. Harvey's vocals and Fowler's mandolin are central to the character of the music and I particularly enjoyed the songs like the title track with prominent mandolin. "Death Warmed Over" is a rug cutting Blues rock tune with mucho tasty guitar and mandolin. I really liked the sound of the electric guitar and mandolin trading licks. Other highlights include "Rider's Blues", a psych tinged Blues rocker with Clapton styled guitar. "Run Thru The Tall Grass" is the most acidic psych-rock tune on this album. "Free" and "One By One" feature pure folk with beautiful vocals from Sandra O'Keefe. And "High On A Mountain" has a Crosby, Stills & Nash flavor. In addition to songs composed for this album the set also includes two songs written by Harvey during his Airplane days. "Shadowleaves" is a Bluesy folk-rock tune with laid back but awesomely tasteful blues guitar. And "Harmless" is a very nice folk-psych song sung against a spacey backdrop. The CD includes extensive liner notes written by Harvey detailing his early years in San Francisco, Jefferson Airplane's formative years and his ultimate firing from the band in the days before they were unveiled to the public, and more recently finding himself in Saudi Arabia as a journalist covering Desert Storm where he met Fowler. A nice set. For more information you can visit the San Francisco Blue web site at: http://www.stuarthamilton.f9.co.uk/sfb. CLICK HERE to read the review this issue of Fowler's more recent Superczar band, and CLICK HERE to read the review of Jones Ave in AI #20.